The great thing about the internet is that anyone can use it, even with limited resources. The troubling thing about the internet is that anyone can use it, even with limited rules on conduct and behaviour. Your identity online should be an extension of who you are in real life. Unfortunately, when you remove the face-to-face contact, some of the lines of behaviour are blurred. It is easy to say you are someone you are not when you cannot be seen. It is easy to be unkind to others when you can’t see their reaction to your comments. It easy to forget what message you are publicly sending to others. Anyone who uses the internet for communication, be it via email, blogs or social networks, is a member of the online community and therefore a Digital Citizen. How can you be a good citizen? The following suggestions will help if you are 9 years old or 99 years old. Before you post, consider what you are sharing. Some platforms like texting or Twitter make it easy to share thoughts instantly. The problem is that once sent, those messages are out there permanently. Even in the case of a chat app, that information should also be considered potentially public because it should be stored by the app’s servers or captured in a screen shot by the recipient. It pays to think about what you are typing or posting before you hit send. Your comments online should be respectful to both yourself and others. Keep in mind that there is no tone in writing so it is difficult to read sarcasm. Make sure all of your posts can be read as neutral or positive. For example, the comment “Did you see Cat’s shirt?” could be interpreted as either positive (complimentary) or negative (mocking). Better to put “I liked Cat’s shirt” or “Did you see Cat’s shirt? I like it”. As the expression goes, if you don’t have anything nice to say, don’t say anything at all. Personal information is currency online and needs to be protected. Last year there were two new identities stolen every second and with the trail of digital breadcrumbs people leave behind, identity theft is becoming even more rampant. Consider what happens when you lose a password and what information they ask for; your mother’s maiden name, your favourite movie star or first pet. Have you shared that information online? This is especially riskier for younger kids who may still have that first pet and be posting pictures of them online. Share what is needed but keep the personal details to a minimum or out of posts entirely. Here is your opportunity to shape your public image and project something positive. People often tell me proudly about how they have no digital identity. With everyone searching people online before they meet, having no identity means that yours might inadvertently be defined by someone else online with the same name. It is important to have a positive identity, especially if you are looking to work now or in the future. I suggest anyone 16 and over create a LinkedIn profile. Due to its professional nature, it does not require any personal information but allows you to keep a public image online. Do you have any other rules you like to follow online? Post them below. 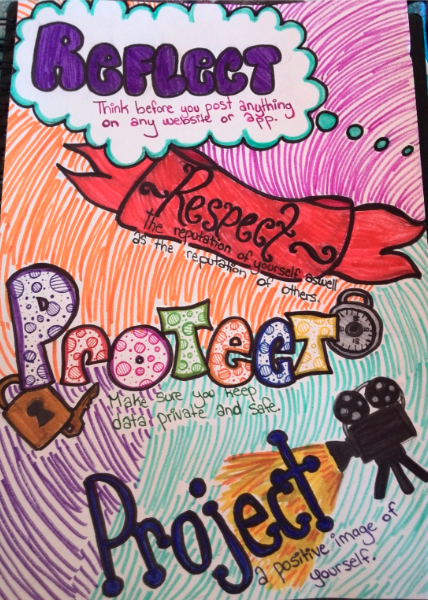 A special thank you to Breanna, a wonderful 8th grade student in the audience at one of my recent school presentations, who created the great artwork featured in this blog post.